Ah… the teenage years! Although my son is only 12 now, I can feel them coming on and am seeing a preview of the food allergy challenges we’ll be facing for the foreseeable future. Teens and young adults with food allergies are at the greatest risk of having a reaction. Risk taking behavior is all part of the teenage brain. And when hormone changes, the desire to fit in and peer pressure are combined with food allergies, innocent situations can turn deadly. Studies show that preadolescents and teens – who typically do not want to draw attention to themselves – shy away from mentioning their food allergies and often intentionally leave their emergency medication at home. What can parents do? Continue talking to your teen about his or her food allergies and the new situations they face. Play out various scenarios and involve them in the problem solving. Importantly, arm them with the language to use to avoid putting themselves at risk. If we can give them some ways to deal with their food allergies in a smooth, off-handed manner, they may be more likely to self-advocate, speaking up when it matters. Share your child’s go-to lines and we’ll include them below. Practice these. Make them your own: deliver the lines with humor, sarcasm, be nonchalant or matter-of-fact. However you decide, just speak up! Situation: (Friends are at a restaurant/cafeteria/movie theater hanging out) Mmm… Try some. It’s so good and I think it’s nut-free. Here have some! Straightforward Reply: That does look good. But, I’m allergic to nuts. I’d love to try it if it’s safe- is there an ingredient list? Alternative Reply: That’s a great looking [brownie, cookie, dumpling…etc]. I think I’m going to pass. But, thanks for offering! Situation Progresses: Come on! Have one little bite!!! Reply: (Distract) No chance. But have you tried the donuts [or insert food – either at the location or elsewhere]? They’re insane! Reply: A little bite can make me really sick. I’d rather hang at this party/football game/movie than head to the hospital. I’m good! Situation: Your teen is worried about bringing his/her epinephrine auto-injectors out with their friends. Reply: Hey guys, I have my auto-injectors in this bag just in case anything happens. Do you want to drop your phone or sweatshirt in here too? Might as well fill it up! Solution: Carry two Auvi-Qs! Each Auvi-Q is about the size of a deck of cards and can fit in most pockets. You DO need to carry two – if necessary, place them in a jacket pocket. And, let a trusted friend know they are there. Situation: You’re at a restaurant/food court/concession stand with your friends. 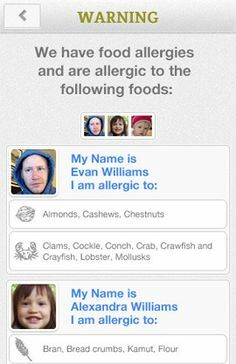 You need to ask several food allergy-related questions, but you’re embarrassed. Reply: (to friends) I have to ask the manager a few questions. I’ll be right back. In this scenario, you can ask questions about ingredients without drawing attention to yourself. Don’t miss the chance to eat safely and without worry or you’ll miss having fun with your friends! Reply: (Before you order… to your friends) Hey, guys. I’m going to need to ask a bunch of food allergy questions. Do you want to order first? Reply: (Before you order… to your friends) Hey, guys. I’m going to need to ask a bunch of food allergy questions. Just keep talking so I don’t get nervous. (Jokingly) You know I have stage fright! Situation: You’re at your friend’s house. Your friend’s mom offers to get you “something to eat.” “I’ll grab you guys a snack!” she says, with no further description. Reply: I have a food allergy. Do you have a piece of fruit I could eat? Reply: I have food allergies. If you don’t mind, can I read some ingredient labels to see what’s safe for me? Reply: Thank you for offering, but I have a food allergy. I’m okay for now. I brought my own snack – all I need is a bowl/spoon/fork! Parents love kids who take charge of themselves and are forthcoming with important information. Telling an adult on-site that you have a food allergy gives you another layer of protection – a second set of eyes and someone to help if you feel you’re having a reaction. Situation: A boy/girl you’ve been eyeing just asked you to go out for ice cream – but you have concerns about your food allergies at ice cream shops. Solution: Find a coffee shop or restaurant with a similar fun feel that you know is safe and suggest you go there to hang out. Solution: Try an activity-based date. Bowling, mini-golf, watching your school’s football game, seeing a band play, etc are sure to bring the fun without too much worry about food. Reply: I’m actually allergic to dairy/nuts/peanuts. Would you mind if we tried this new frozen yogurt shop? I’ve been dying to try their sorbet flavors! Mentioning your allergies right away isn’t a deal breaker; it’s a way to ensure that you’ll feel relaxed on your date. And when you’re more relaxed, you’re more likely to have fun! Call your airline and inquire about their food allergy policy in advance. Ask specifically about early boarding and in-flight announcements. Most airlines will allow passengers to board the plane early in order to wipe down surfaces (this includes seat backs, seat belts, tray tables and knobs, armrests). Be sure to bring enough baby wipes or antibacterial wipes (such as Wet Ones) to cover all the legs of your travel. Again, ask about pre-boarding at the gate. If you’re traveling to a warm weather destination, you’ll need to remember to keep your epinephrine auto-injectors at room temperature – even while enjoying the beach or pool. Pack a cool pack (like this one) and an insulated bag (like this cute lunch bag). Store the cool packs in your hotel’s mini-fridge (who needs a $15 bag of M&Ms anyway!?) or plan on ordering a to-go cup of ice to keep the medicine cool poolside. A hotel or resort’s food services manager can usually help you navigate menus. On our last vacation, the food services manager had food allergies himself and was invaluable in hunting down ingredients and safe alternatives for our family. Befriend this fantastic person! If you’re planning on visiting an amusement park, taking a hike or being similarly active, consider packing a backpack into your luggage (or use one as your carry-on!). You’ll need to bring your epinephrine auto-injectors wherever you go – especially on vacation when you’re away from home cooking, familiar restaurants and local knowledge of hospitals and doctors. Backpacks can make carrying it easier depending on the activity – simply slip the insulated bag into your backpack and go! Airline travelers should bring their own snacks/meals on board flights to ensure their safety. Refrain from using airplane blankets and pillows as allergen residue may reside there. Bring a baby or antibacterial wipe to the bathroom to wipe down door and knob handles. Last March, we took a ski vacation up to Mount Snow in Vermont. The folks at the mountain were extremely helpful when it came to food allergy issues, including handing over ingredient lists for us to review. And, as it turns out, my son’s ski instructor was well-versed in carrying epinephrine as his younger brother had food allergies. We had SUCH a great experience there, I wanted to pass along a few *specific* points of information for those of you thinking about going. We were happy to learn that the hamburger buns at all lodges were sesame seed-free and SAFE for my son! An unusual find! Not a great photo from my frozen hands, but the chicken nuggets were made by Tyson, a brand we deem safe at home. Dairy, egg, sesame seed, peanut and tree nut-free. For those of you on a gluten-free diet, you’ll be excited to hear that they not only offered gluten-free bread at the main lodge, but they sold Liz Lovely gluten-free cookies as well as Monkey Chew nut-free, gluten-free granola bars. Woohoo! For dinner, we found this great restaurant, Last Chair. The food was excellent, the manager and waitresses knowledgeable about food allergies PLUS they have an arcade to entertain the kiddos while you wait for a table. A win all around! Clearly NOT dairy-free, but check out that plate of nachos. That’s a PIZZA TRAY underneath. The Last Chair is not skimping on portions! We recently ate at my father-in-law’s favorite restaurant chain: Sonny’s BBQ. It’s a southeastern BBQ chain that reminds my father-in-law of the time he spent at the University of Florida. So whenever we’re in Florida, we “dine” there. As usual, before we went, I reviewed their allergen menu and identified a few items my FA son could choose from. And, as usual, I verified all my information with the manager. Now, let me say, Sonny’s manager couldn’t have been nicer or more responsive. He researched the ingredients for the hamburger bun and the cornbread from his suppliers and was willing to bend over backwards to accommodate my son as best as he could. And, as a result, we enjoyed a safe and yummy meal. But I noticed something that was distressing in asking all our usual questions. While the manager knew his ingredients and was willing to investigate further when he wasn’t sure, Sonny’s BBQ corporate may not understand how food allergies actually work. For example, Sonny’s Corporate allergen menu shows that their fries are milk, egg, tree nut, peanut, shellfish, and SOY free. But that’s only if you eat them UNFRIED because their manager confirmed they were fried in vegetable oil. While soy is no longer a concern for my son, I can imagine this mistake would pose a danger. If I had read their allergen menu and decided to just take it at face value, my son could have wound up with some serious problems. Corporations need to take into broader considerations when publishing food allergen menus. Their menus must reflect fry oil and cooking methods as well as supplier-driven “manufactured on equipment” issues. More information of this kind allows diners to make better, clearer choices. Whenever I can make more sure-footed decisions about meals for my son and other food allergic family members, I feel grateful and relaxed. And, that’s something that will keep me coming back.